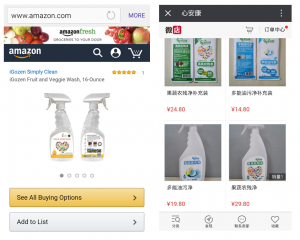 Los Angeles, USA, May 9, 2016 /ChinaNewswire.com/ - U.S.-based iGozen, maker of an organic cleaner that strips away harmful elements from fruits and vegetables, says a Beijing company is copying its images and products for profit in China. iGozen asserts that Beijing's Xin An Kang has produced a fruit and vegetable washer whose design and marketing copies that of iGozen, which has U.S. patented technology in its product line. iGozen's acid neutralizing product is enforced by patents in both the United States and China. Its patent #7,662,416 was granted on February 16, 2010, in the United States; and in China on March 11, 2015, it received patent #201420660960-6 for an anti-virus PM2.5 mask. The company also owns a diverse portfolio of high-caliber products and many other patents and trademarks in the U.S. and China. iGozen is not alone in trying to protect its intellectual property rights and brand in China. This past week news broke about a Chinese Fujian-based brand named Uncle Martian copying the logo for American clothing brand Under Armour. And in recent years other foreign firms and organizations like Disney, Microsoft, and the BBC have faced copycat products derived in China. iGozen says it reserves the right to take legal action against companies in the future.